The story of Charity Woodrum’s early years could make a convincing children’s book. As a little girl living in Canyonville, she was good at math and loved watching the night skies. Her parents, who had never finished high school, worked hard at various jobs – driving trucks and school buses, cooking in school cafeterias, cleaning houses. Their daughter dreamed of a career in the space industry, but she didn’t know anybody with a job like that. So she studied hard, took calculus (the only student in her class who wanted to) and eventually became a nurse. But she never stopped wondering about worlds amongst the stars. And one day, putting down a book by cosmologist Steven Hawking, she decided to go back to school and study physics. Her talents earned her an internship at NASA. While there, she did work that was used by some of the top scientists in the country. Today she continues to pursue her studies in astrophysics, preparing herself for the day when she may be able to work with ground- or space-based telescopes while researching space activity. 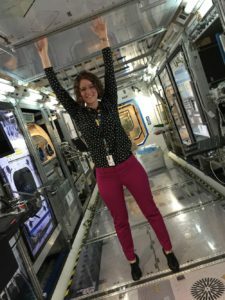 Thought it sounds like fiction, Woodrum’s background proves that out-of-this-world STEM careers are within reach of Douglas County youth with good imaginations. Woodrum admits that growing up in Canyonville and Myrtle Creek, it wasn’t easy to find people – especially girls like her – who shared her interests in math and science. That made it hard to picture how she could make a living in those fields. “Unfortunately, there are people who will tell you that you can’t do it,” she said. “But if you ignore that and follow your passions, you will eventually find people who are a lot like you. At one point Woodrum may have questioned the wisdom of finding her tribe. During her internship, the University of Oregon undergraduate stood a few feet away from 11 NASA scientists waiting to hear what she had to say about the significance of data captured by the Fermi Gamma-Ray Space Telescope orbiting Earth. 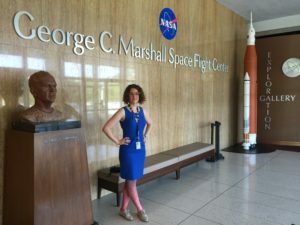 Charity Woodrum stands outside the George C. Marshall Space Flight Center at NASA last summer. Daunting though it was, Woodrum rose to the challenge. Her 10 weeks at NASA yielded many personal and professional milestones. Perhaps the capstone was her work with gravitational waves. Woodrum’s research resulted in a contribution NASA could use right away. The Fermi telescope is positioned to pick up gamma rays released by space activity that indicates the emission of gravitational waves. Scientists were evaluating whether it was useful to shorten intervals of data analysis on footage from the telescope. After analyzing the data, Woodrum concluded that the telescope was not missing any gamma ray bursts, and so scientists opted not to analyze footage on a more frequent basis. “It was a decision that would change how they would sift through the data, basically,” Woodrum recalled. Her reaction to being able to advise some of the world’s top scientists? It was a dream that didn’t unfold in a straight line from Woodrum’s 2003 graduation from Canyonville Christian Academy. The summer after her graduation, she got a construction work job, roofing houses in Myrtle Creek. From there she took a position as a sales representative at Dell’s call center in Roseburg. The company closed the center abruptly in 2007. Woodrum was one of the employees who qualified for a program available to dislocated workers through Umpqua Training & Employment and took advantage of the opportunity for retraining. She said she decided to go to nursing school at Umpqua Community College, in part because she had known others who had completed the program. “I knew it was a way to make a positive impact on the community, and I still think it was a good decision,” she said. While at UCC, Woodrum met instructors and other staff members who impressed her because they clearly were doing work they loved. One of them was Ken Carloni, a science instructor who had Woodrum in multiple classes and today says he considers himself lucky to have been her professor. Carloni said more than 5,000 students have come through his classes in his 30-year career at UCC. Only a handful have stood out, and he said Woodrum ranks prominently among them. Another UCC leader Woodrum cited as inspirational was David Hutchison, then director of the college library. Again, the admiration was mutual. Hutchison nominated Woodrum for the library’s Outstanding Student award eight years ago. His selection described Woodrum, the library’s work study employee at the time, as smart, friendly, efficient and accurate. After graduating from nursing school in 2009, Woodrum became a community health nurse at the Douglas County Health Department. She then worked for a short time in Corpus Christi, Texas before ultimately returning to Oregon. Though Woodrum still believes nursing is a worthy career, she found it emotionally draining. Reading books by Stephen Hawking and Carl Sagan helped her decompress while off-duty. Gradually, she realized that she didn’t want astrophysics to be a release valve from the stresses of her life. She wanted it to be her life. She began the transition by going back to school part-time. In addition to signing up for astronomy and calculus classes at the University of Oregon, Woodrum volunteered at Pine Mountain Observatory in Bend. There, she learned more about operating a telescope and observing the celestial bodies populating the night sky. It didn’t take long for Woodrum to distinguish herself as a physics student. She won UO’s Weiser Undergraduate Research Prize, then was selected for the 2016 summer internship with NASA. Charity Woodrum enjoys a light moment at NASA during her 2016 internship. Going to NASA affirmed Woodrum’s life-altering decisions in a big way. On her first day at the Marshall Space Flight Center in Huntsville, Alabama, she found herself passing an authentic Saturn V rocket – one of only three in the world – and hearing speeches from people who have made some of the biggest discoveries in the history of humanity. Woodrum said the NASA folks not only were bold people filled with passion for their projects, but also eager to explain them with the intern fortunate enough to work beside them. 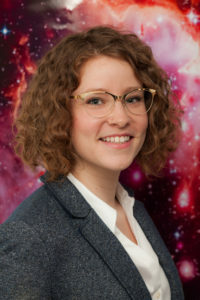 As she completes her degree at UO, Woodrum is co-writing a paper on galaxy evolution for the Astrophysical Journal, along with the associate director of the Gemini Observatory. She hopes eventually to work for a large telescope facility, either for a ground-based or space-based instrument. Such positions are often 80 percent keeping the telescope functional and 20 percent research. It’s a long way from a tiny school in southern Douglas County to the halls of the nation’s space program. But Woodrum is convinced that similar paths are open to county students who apply themselves. The method can apply to planning a future as well. Woodrum said students will know they are on the right road by following their passions and finding others who share them. “I would say if you love what you are doing, you will have the motivation to keep going when you hit a hurdle,” she said. It’s advice Woodrum herself has followed to the stars and beyond. For those science-inclined students who would like to learn more about Charity Woodrum’s work for NASA during her internship last summer, here’s an explanation she wrote that goes into a little more detail. Over 100 years ago, Albert Einstein, with his general theory of relativity, predicted that gravitational waves should exist. A little over a year ago, the Laser Interferometer Gravitational-Wave Observatory detected them experimentally for the first time and confirmed Einstein’s theory. LIGO has detected gravitational wave signals two different times now, both occurring because of the collision of two black holes (see link below). When the black holes collide, they cause ripples in the fabric of space-time, which LIGO is able to detect. During my internship, LIGO was updating its instrument to make it more sensitive. With the increased sensitivity, scientists are hoping to see not only more gravitational waves, but also gravitational waves coming from the collision of a black hole and a neutron star (extremely dense stars) or the collision of two neutron stars. It is believed that short gamma-ray bursts are caused from the collision of a neutron star and black hole or the collision of two neutron stars. The Fermi Gamma-ray Space Telescope “sees” 40 short gamma-ray bursts per year, which is more than any other active space mission. The algorithm that I worked on doubled the amount of short gamma-ray bursts per year, to a total of 80 per year. The Fermi team and the LIGO team are working together in a collaboration to detect the same event (the collision of neutron star – black hole or neutron star) through two different messengers. LIGO will see the ripples in space-time and Fermi will see the gamma-ray burst. LIGO and Fermi detect different types of information from these events, so if they see the same event, they can share information, helping both fields. So, in short, gravitational waves and short gamma ray bursts are companion messengers from the same violent event – the merger of a black hole and an extremely dense star. LIGO “sees” gravitational waves and Fermi “sees” gamma ray bursts, and the two teams are working together to gather as much information about these events as possible. Soon after this story was published, DCPSS learned of the deaths of Charity Woodrum’s husband and young son. We wish to express our deepest sympathy to Ms. Woodrum, whose achievements are inspiring to our community at large and especially to parents, students and educators in Douglas County.